Teachers who have expertise in Jeevanvidya philosophy and its applications conduct classes for children (3 to 15 age group). The main objective of these classes is to build a strong foundation of values of life which are based on the universal principles of Jeevanvidya philosophy. These classes are conducted over teleconferences. Topics covered include gratitude, learn with fun, perseverance, mind management strategies for success and happiness etc. These classes were started in August 2017 with 10 students and now over 100 students are attending them. A recent survey conducted for the parents whose children are a part of these classes have observed a positive change in the behavior of their children and would highly recommend these classes to other parents as well! A similar program is being implemented in the schools of Dallas, Texas since 2015. 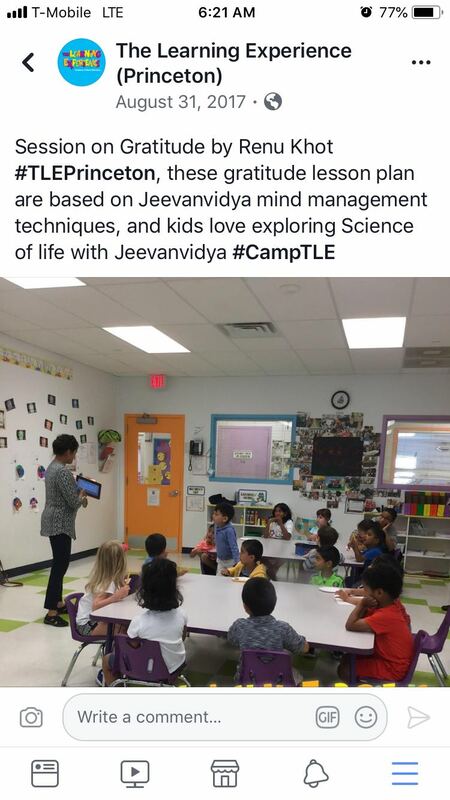 Jeevanvidya's mind management workshops were conducted for educators in Dallas in 2018. Over 70 educators participated in the workshop and all of them stated that this workshop met or exceeded their expectations in their feedback. Our video conference classes for age group 4 to 7 are full at present, however you can enroll your kids in the wait-list. Please refer the below schedule of these classes for age group 7 to 15 and enroll your kids as per their age group and time preferences. “The Learning Experience” is a day-care center in Princeton for kids from six weeks to five years. Every summer break the center encourages and invites guests to present and introduce kids to different activities ranging from philanthropy, sports, arts, etc. The center took this opportunity to introduce kids who belong to the age group of 3 years to 5 years to Jeevanvidya and its principles. Jeevanvidya student Renu Khot conducted over three sessions at the center and presented stories on gratitude followed by an interactive Q&A session. 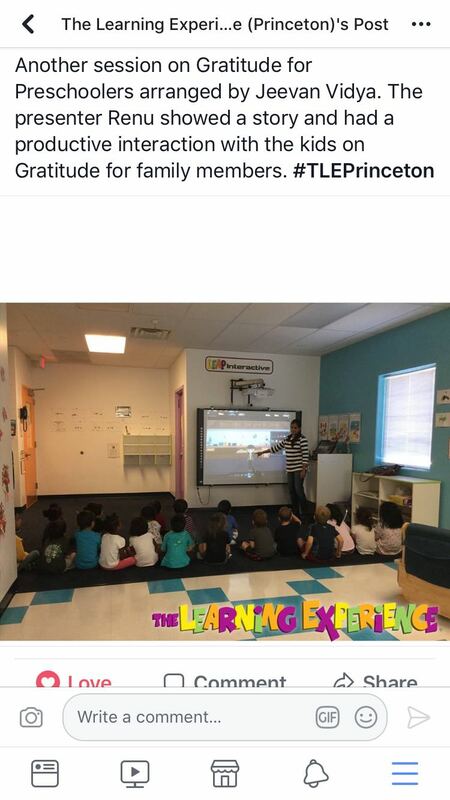 The kids were encouraged to speak up on their thoughts about gratitude and express their gratitude towards their parents, teachers, and friends. The session was made interactive by having the kids make posters and cards expressing their gratitude. We look forward to hearing from you. Enroll your kids in these Character Building Classes and experience the positive changes in them. Study groups for adults are conducted over weekly teleconferences or in the form of in-person meetups. Adults interested to learn more about Jeevanvidya philosophy form groups and study Jeevanvidya concepts by referring Jeevanvidya material such as books, recordings and have interactive discussions. Jeevanvidya experts guide them on a practical application of Jeevanvidya in various areas such as work-life balance, parenting, professional development, health, wellness, etc. People share their experiences about how the implementation of Jeevanvidya techniques on a day to day life helped them achieve their goals. At present, Jeevanvidya study groups for adults are conducted in Charlotte, NC and Bay Area, CA, in the USA. Jeevanvidya English teleconferences for educators, counselors and corporate professionals are held monthly. Stay tuned every month for a new recording. In future, Jeevanvidya Center Inc. is planning to arrange special lectures and webinars providing guidance to the students of colleges and universities about academic and career success, guidance for corporate professionals on stress management and professional development. Jeevanvidya experts will also conduct courses giving in-depth knowledge of Jeevanvidya to interested people. Jeevanvidya global conventions will be arranged once in every two years in one of the states in the US where Jeevanvidya students from all over the world can come together and participate in various events such as lectures, workshops, interactive discussions, group activities etc. Our second Jeevanvidya global convention will be held on June 30 and July 1, 2018, at Hotel Crowne Plaza, Charlotte Executive Park, 5700 Westpark Drive, Charlotte, NC, USA, 28217. The Jeevanvidya Center Inc.'s mind management program began in 3 public schools in Wylie Texas in 2015. The program has expanded to 5 more behavior units and a few General Education classrooms since then. The results have been very encouraging as evidenced by the student and staff testimonials seen further below. “When we had a test in Math, I did the walking affirmation in BEST and all day which lead me to be confident and excited." “When I’m fighting my older sister, I breathe and say positive things and it calms me back down"
“I have used these strategies every day before every class. My grades have jumped very highly since then. “When someone made me mad, I decided to be positive and let it go." “When I was practicing my drum set at my house, I was getting kind of frustrated with messing up and I just relaxed for a minute and thought positive and it helped me not be stressed." “I was walking to my writing class and I was kind of out of the game but my walking affirmations made me relaxed." “I was stressed out due to a test in History so I went home and laid down in silence and decided to just breathe and it helped me calm down and be ready to study." “I am more motivated to go to classes that I dislike. Math has always been hard for me but I have achieved the goal of raising my grades thanks to your magnificent relaxation time." Walking relaxation: A good replacement for the worry of multi-tasking that we usually do as we pace through the school. The connection with the movement helps to make an automatic thought as you begin to feel the cadence of your steps. I enjoy this part the most in my home life walking outside to help clear my thoughts of negativity and anxiety, and replace it with gratitude and happiness. Well-wishing: This has been such a pleasant exchange between my students and myself at the end of our time together. It just ends our time with a smile a caring and loving feeling. The students have enjoyed this part more than expected. Based on the success of this program, around 40 educators attended the Jeevanvidya mind management workshop this summer of 2018. Jeevanvidya Center Inc. will provide personal and group counseling to the people in various areas. Counseling sessions aimed at helping people who are facing specific challenges in many areas of their life. Jeevanvidya experts will provide specific guidance using Jeevanvidya principles and will recommend practical techniques that will help them successfully deal with the challenging situations.